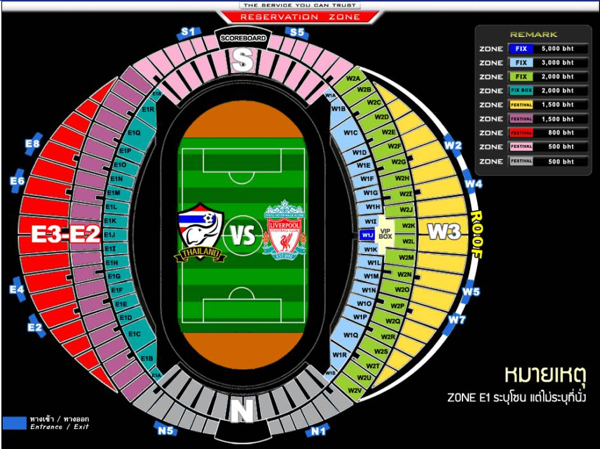 Liverpool FC has released ticketing information for the pre-season game in Bangkok, Thailand on Sunday 28th July. As an official branch we are given priority ticketing privileges. *VIP Category, (W1J), Category 1(W1), Category 2(W2) and Category 3(E3) will entitle ticket holders to attend the open training session at Ragamagla National Stadium. Please note that open training session date will be released closer to the date. Members are required to send in their ticket requirements to us on reds@delhikop.com latest by 27th April 2013 midnight. We will then compile the list and share with OLSC co-ordinator and arrange to receive payment from you. This information should include the number of seats in each of the above categories – CAT 1 to 3. If there is a large number of interested fans, we will interact with the travel operators to get a better rate as a group. This, however, is not mandatory and fans are welcome to make their own arrangements. Since Thailand is the venue that would be closest to Indians on this tour, we will not get a better opportunity to watch the Reds play, if we have not already. This also means that there would be a huge demand for the tickets so you’re requested to respond as soon as possible.